A study has gained new insight into the minds of dogs, discovering that those that are anxious when left alone also tend to show ‘pessimistic’ like behaviour. The research by academics at the University of Bristol, and funded by the RSPCA is published in Current Biology (12 October). The study provides an important insight into dogs’ emotions, and enhances our understanding of why behavioural responses to separation occur. Professor Mike Mendl, Head of the Animal Welfare and Behaviour research group at Bristol University’s School of Clinical Veterinary Science, who led the research, said: “We all have a tendency to think that our pets and other animals experience emotions similar to our own, but we have no way of knowing directly because emotions are essentially private. However, we can use findings from human psychology research to develop new ways of measuring animal emotion. 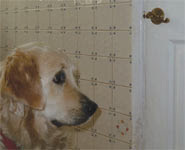 In order to study ‘pessimistic’ or ‘optimistic’ decisions, dogs at two UK animal re-homing centres were trained that when a bowl was placed at one location in a room (the ‘positive’ position) it would contain food, but when placed at another location (the ‘negative’ position) it would be empty. The bowl was then placed at ambiguous locations between the positive and negative positions. Professor Mendl explained: “Dogs that ran fast to these ambiguous locations, as if expecting the positive food reward, were classed as making relatively ‘optimistic’ decisions. Interestingly, these dogs tended to be the ones who also showed least anxiety-like behaviour when left alone for a short time.